XAccess (Xtracycle Access Foundation) makes load-bearing bicycles possible for people who need them most yet can least afford them. We help create economic opportunities by allowing people to move themselves, their goods, and their families, using human power. XAccess is the nonprofit sister company of Xtracycle LLC, maker of the world's first Sport Utility Bicycle. Profits from Xtracycle LLC support XAccess. Read more about Xtracycle and its products at Rando VTT. With help from Rick Randall, a civil engineer from Oregon who volunteers on water projects for the Makindu Childrens Center (MCC) this orphanage and community center is using two load-carrying bicycles built by Kickstart and designed by XAccess. Our product development collaboration with Kickstart in Kenya led to the development of the Longtail bike extension. The Longtail carries up to 100 Kg loads on its steel rack, and costs only $24 to the end user. Thanks to you and [ApproTEC] for helping these people. its greatly apreciated." The Xtrabike allows the user of any bicycle to securely carry up to 200 pounds of load. After installing the Xtrabike frame with locally available tools, the user can load and unload the Xtrabike is faster than a truck. Purchased for the equivalent of $50 or less, it fits into the budget of most people in our project areas. With the standard rear rack on most Chinese-made bicycles, the load sits on top of the rear wheel. The center of gravity is high, and heavy loads affect the handling of the bike. Bulky loads do not fit along the side of the wheels, because they interfere with the rider's foot. The issue is not the weight, but the where it's carried on the bike. When high and unstable, the weight makes riding a dangerous challenge. When low and secure, it's as easy as ... riding a bike! With an Xtrabike, there is ample space to carry loads low on the bike, without interfering with the pedal stroke. A second rider can also sit comfortably on the rear of the bike. Due to the longer wheelbase and the Xtrabike's rigid steel frame, the weight of an adult passenger or a couple children does not significantly change the riding properties of the bike over flat and rolling terrain. How does the Xtrabike stack up to other options for carrying load? People in our project sites have other options for carrying load: buses, trucks, carts, motor-driven rickshaws, and bicycle rickshaws, for example. Each has advantages and disadvantages. Consider that the annual income for a Kenyan is about $400, according to the BBC. Even an Indian-made three-wheeled bicycle rickshaw costs nearly one year's income. A personal automobile or truck is not even in the picture. Sharing a truck amongst a community is an option, but not for an entrepreneur who needs to use transportation every day. With an Xtrabike, an average person can afford to transport loads securely over distances comparable to an automobile. Why is the Xtrabike so affordable? Because it has few moving parts, and re-uses the real wheel, brakes, and drivetrain of the original bicycle. (Buying an Xtrabike does require owning a working bicycle to attach it to.) Wheels are the most expensive components of bicycles. Buying a rickshaw or trailer entails buying two or three new wheels, while buying an Xtrabike does not require buying any additional wheels. Are there plans for the Xtrabike? How can I or my organization build an Xtrabike? Example of a Solidworks model of the Xtrabike produced in the Afribike workshop in Johannesburg. Please read more about obtaining plans for XAccess bicycles. The Xtrabike is designed to be easily produced using commonly available materials and simple welding and fabrication techniques. Organizations with solid technical expertise and a few basic tools can build Xtrabikes on their own without needing an XAccess representative. This vastly reduces the cost of spreading this transportation technology. To facilitate the process, we have a set of plans and engineering models for the Xtrabike, as well as for the Longtail. We can send paper plans or digital files in Metric or English units. Depending on the size of your organization and the intended use of the Extrabike, there may be a fee for the models and drawings. Please read more about obtaining plans for XAccess bicycles. .
A South African man carries two sacks of corn low and secure on a trailer. The trailer is a good option for carrying bulky items short distances; its heavy weight and extra wheels make it more tiring to ride over medium to long distances. This design also requires the purchase of two new wheels, the most expensive bicycle components. A Dutch Afribike volunteer shows how the same load rides on an Extra Bike. With nearly the same surface area for packing loads and only two wheels, the Extra Bike is cheaper, more nimble, and less tiring to ride. Designed in Nairobi, Kenya, in partnership with Kickstart International, the Longtail is a light, strong, and inexpensive bike extension. The longtail is projected to cost $30 to an end user, which is 30% of the cost of a front-loader and 5% the cost of a bicycle rickshaw. The end-user cost of the Longtail is also lower than the XAccess Xtrabike. The Longtail is our internal name, but during the Bigga Boda Trial Market in '05 and '06, we will be using the name "Bigga Boda" as the regionally-specific brand for this technology. See more pictures of the Longtail in use by Makindu Children's Center in Makindu, Kenya. For more information about buying or building a Longtail for your organization, Please read more about obtaining plans for XAccess bicycles. How does the Longtail compare to the Xtrabike? ke. The Longtail requires a couple more steps for the user to secure loads, when compared with the Xtrabike, as it does not have the wide fold-down load trays. However, using innertubes or rope, a rider can securely fasten over 100Kg of water, and many configurations of dry goods. Please read more about obtaining plans for XAccess bicycles. The FreeRadical and the Xtrabike are two different designs of the same root concept: a simple bike extension that radically increases the carrying capacity of an ordinary bicycle. While the Xtrabike is designed for cost and durability, the Xtracycle FreeRadical is optimized for weight, performance, and style. Produced in Taiwan and distributed mainly in North America and Europe, the FreeRadical is the ultimate in performance among Sport Utility Bicycles. Please visit www.xtracycle.com to learn more. Xtrabike, Longtail, and FreeRadical: Which of these bicycles should my organization use? We have many technologies at our disposal, and each has different points in its favor. Beyond the concept of bike extensions, which have proven to be an effective and inexpensive way to carry load with human power, we also recognize the importance of trailers, customized load-carrying bikes and, of course the human body, as effective ways to move load. If you are interested in any of the technologies we offer for equipping your community or organization, we will help you understand the issues and find a good fit. If you are looking for the ultimate bike for development work, one that will take you around or off-road with gear and material for water projects, immunization programs, etc., we can supply you. If instead you need to make a transportation impact in a community without much money, we can make affordable load-carrying bikes available. If you are working with an organization with engineering, welding, or fabrication skills and resources, you can purchase plans for a Longtail or Xtrabike and make them yourselves. Please contact us at techinfoATxaccess.org with your technical questions. In 1994 a Stanford engineering student named Ross Evans experimented with new designs for load-carrying bicycles. The existing designs either had three wheels, put the weight up front, or towed it behind in trailers. In short, they carried weight but no longer rode like bikes. Through a grant from the Stanford Center for Latin American Studies, and the H. Michael Stevens Public Service Fellowship from Stanford's Haas Center for Public Service, Evans traveled to Nicaragua and started a bike fabrication shop teaching Nicaraguan war veterans to repair and build cargo bikes. While working at the shop in Nicaragua Evans invented a two-wheeled bicycle conversion that could carry hundreds of pounds in its rear racks and still ride like a bike. Better yet, this invention could be produced at low cost and attach to any existing mountain bike, extending its wheelbase and turning it into a load-carrying bicycle. One early Xtracycle 'product tester' was Adam French, a close friend of the founders and a fellow outdoors expert with experience starting a non-profit in Africa. He helped realize the dream of bringing freight cycling technology to those who could least afford it by starting a new nonprofit while Evans and Spencer continue to lead Xtracycle LLC. The Foundation allows Xtracycle's superb technology and design innovations to achieve their potential in places American bicycle companies typically ignore. Ten years ago in the small west Kenyan town of Eldoret, 100 miles North of Kisumu, a farmer feeds his family of three off his land. Six years later, his wife has complications from the pregnancy of their fourth child. Forced to sell half of his plot to afford medical care for his pregnant wife, he knows he'll need to make money soon. His wife sees an advertisement in a newspaper in the hospital for a human-powered sunflower seed press that makes a valuable cooking oil. After she has the child, they decide to spend the rest of the money from the sale of the land on the press. A year later, their hard work is beginning to pay off. They get seed deliveries from three local farmers, and sell the home-pressed oil to friends and in a weekly market. But the many bike trips required to deliver the oil physically exhaust the couple. The bottles bounce out of the small bike rack and break. They're making enough to get by, but they don't have the energy to raise their children the way they want to. As for improving their transportation, buying a car is out of the question - even the large imported bicycle rickshaw at the credit union downtown costs over three year's income. The couple find no option but to continue. Riding to make a delivery in town with a heavy box of home-made cooking oil balanced on his rack, the farmer passes a man loading up an unusually long bicycle with two 100 pound sacks of corn. He stops to talk to the man and check out the bike. The front of it looks like a normal bike, but where the rear wheel goes, a bright blue add-on frame begins, with two built-in steel side racks and a top rack housing the rear wheel. The man tells the farmer where to buy the frame. 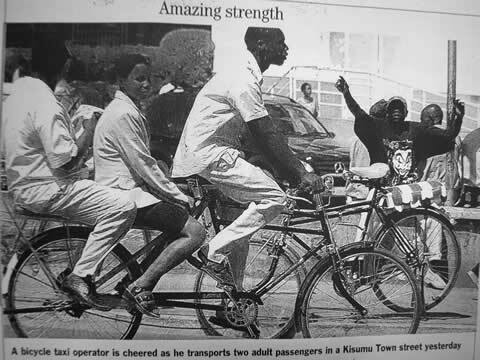 The next day the farmer rides the bus 100 miles to Kisumu, and buys one. It costs one month's income, a challenge to save, but much less than a rickshaw because it reuses the all the existing parts of his current bicycle. With a friend who knows about bikes, he installs the new frame. The next day he easily loads up what used to take four bike trips in the bike's side racks. With over 140 pounds of oil, the bike doesn't have its usual zip, but the farmer has no problems balancing the load or maneuvering through the tight streets. On his second and last trip of the day, returning home with empty bottles to refill for his customers, he picks his two kids up from the school and the three ride home with the empty bottles cheerfully clinking along. He and his wife have three hours more each day they can devote to their kids, and they can increase their deliveries 25% over their previous bike. With this jump in business they will be able to pay off the new frame in four to eight weeks and apply the increased profits toward building a better home for their family. This is the story that drives us. Load-carrying bicycles make a huge impact on the fight against poverty in developing nations, on a family-by-family level, without the environmental impact of cars and trucks. Third World nations are shifting from subsistence to cash economies. Along with this change comes the need for job creation, new businesses, and transportation. But we can't simply apply the transportation solution used by the West in the past century - massive dependence on the automobile - because its expense is astronomical in Third World terms, and its environmental impact has contributed substantially to Global Warming. XAccess believes an affordable, environmentally friendly solution exists, and we are committed to finding it. We connect key groups in the transportation equation to solve this problem, and bring to the table valuable bike expertise and freight-bicycle designs. Without an organization or force to bring end-users, manufacturers, engineers, and designers together, the solution won't happen. Thus our organization is needed, to lead the effort to produce human-powered transportation solutions that can create business opportunities and support people through rapid changes in developing economies. What is the mission of XAccess? The mission of XAccess is to make load-carrying bicycles available to people who can least afford them yet need them most. With simple and extremely useful bikes, we help disadvantaged people get jobs, start entrepreneurial businesses, and transport themselves and their families, using the greenest power source around - human power. Where cargo bikes are unheard of, expensive, awkward to use, or hard to make, we will educate people, distribute affordable products, improve designs, and enable local fabrication to make this vision a reality. What is the initial strategy for achieving this mission? To find great models for deploying load-carrying bicycles, we will continue to learn by doing. Our first project, and a promising example of the results XAccess can achieve, was a partnership with Afribike in Johannesburg, South Africa. Together with the ITDP we helped Afribike establish a small manufacturing center, and developed a design specific to their needs. Additionally we assisted them in working with a large scale manufacturing facility to produce the ExtraBike, which Afribike then made available to the public through its existing network. 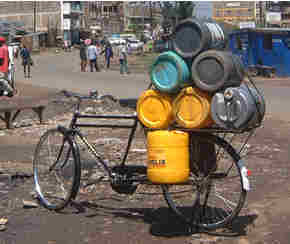 Our current project energy now turns to Kenya, where people have a huge reliance on bicycles, but few options for carrying heavy loads. We have partnered with ApproTEC, a nonprofit organization which has successfully deployed a handful of human-powered technologies in Kenya, such as a water pump and a seed oil press. Together with ApproTEC, we will test and improve the ExtraBike product, research ways Kenyans can use utility bicycles to start and improve businesses, and distribute the ExtraBike to Kenyans. We will also take away manufacturing techniques and expertise: new jigs and fixtures, and quality control processes. With each project, XAccess makes human-powered, environmentally friendly, affordable transportation available, and improves our understanding of developing-world transportation needs and distribution models, and our own designs. As we continue to identify effective models for distributing load-carrying bikes, and build our expertise in local manufacturing, we will replicate our successes in new settings. To help us pick future projects and partners, we will continue to build our substantial network of bike-related organizations and stay educated through this network. To aid XAccess with its mission, Xtracycle LLC has granted XAccess free use of the ExtraBike IP, which is covered under a US patent. How is XAccess connected to a community or network? XAccess is a young but well-respected group joining a vibrant, worldwide community of people tackling issues of transportation technology and development. Consistent with our strategy of connecting producers, designers, manufacturers, and users of freight cycling technology, our network may be our strongest asset. Our contacts fall into four categories: industry (bicycle, adventure sports, and technology companies), development organizations, academia, and bicycle advocacy organizations. As the ITDP writes, "Human powered vehicle technology desperately needs to be modernized, and this can only be done in close cooperation with the industry." Foremost within our set of industry contacts is Xtracycle LLC, which manufactures and designs world-class Sport Utility Bicycles. This is a phenomenal resource for industry contacts, because through Xtracycle LLC we are able to attend major bicycle industry events such as Interbike in Las Vegas, and learn about philanthropic opportunities within the bicycle and adventure sports world (ex: Patagonia Environmental Grants Program). Other industry contacts include Freeplay, which manufactures and distributes hand-powered lights and radios, freeing the user from battery dependence. Freeplay has great experience distributing and manufacturing technology in Africa. Our development contacts include the ITDP, which works with the World Bank's transportation division, among other projects. Additionally, Adam French attended Work 2001, a conference hosted at the University of Witwattersrand in South Africa. The conference opened speaking and partnership opportunities and led us to focus on job creation as part of our core mission. Within academia, XAccess has strong ties to Stanford through founder Ross Evans. Adam French recently attended a conference hosted at MIT by an organization called Think Cycle whose goal is "Creating a Culture of Design Innovation for Challenges in the Environment and Underserved Communities." French also has contacts at the University of Nairobi, who will be involved in our project work in Kenya. Our bicycle advocacy contacts are especially strong. We have personal contacts at three of the most successful bike donation programs: Pedals for Progress in New Jersey, Bikes Not Bombs in Massachusetts, and Re-Cycle in England. Physically our desk sits in the Berkeley Center for Alternative Transportation (CAT), which, in itself is a fantastic way to stay immersed in the cycling world. The CAT also houses Pedal Express, a bicycle delivery service, Berkeley Friendly Bike Coalition, a local bike policy group, the Bay Area Sustainable Transportation Project, which teaches schoolchildren about alternative transportation, and Fab CAT, a membership-based workshop for producing and experimenting with new bike designs. The Berkeley CAT connects us to its sister organization, the Eugene CAT, an internationally respected center for load-carrying bike design. We have built our network by locating our headquarters in a hub of bicycle activity, attending relevant conferences, visiting organizations, maintaining personal contacts, and meeting new ones through the internet. We are currently producing a web site that will allow others to find and contact us. Who are the people of XAccess? Director Paul Freedman carrying three kids on the back of his Xtracycle at the Alemany Farmer's Market in San Francisco. Paul Freedman, Director: Paul brings 5 years experience in project management and communications in the high tech industry, and a passion for bicycle entrepreneurship. As a teenager growing up in Boston, he bicycled around New England and eventually rode across the USA in 1994. He went on to sell bikes in one of Boston's finest bike shops, Belmont Wheelworks. Observing the entrepreneurs from Boston's Merlin Metalworks and Seven Cycles sell their latest Titanium frames to Wheelworks' owner, he dreamed of one day returning to Wheelworks as an entrepreneur. Committed to the bicycle as key element of strong communities, Paul has bicycle commuted to every job he has ever worked. He is also the founder of Fossil Fool, a bicycle accessories company. He is also a published writer and has traveled to over 25 countries. Paul holds a BA degree in Computer Science from Harvard. Paul has served as the Director of XAccess since 2003. Alex brings over 15 years of experience selling high-capital goods in Kenya. From selling welding gasses to cattle-branding equipment to Volvo trucks to cement, Alex has criss-crossed Kenya countless times. As a truck salesman, Alex saw how valuable bicycles are in delivering the goods and raw materials to homes and businesses. Alex grew up in Nairobi and holds a degree in Electrical Engineering from Kenya Polytechnic. Ed was trained as a welder in the demanding environment of the US Navy, repairing steam pipes and hull leaks during active missions on a frigate. He has headed up the production and design department of a successful jewelry company, and has worked as a custom metal fabricator. As a professional kayaker, designed an armored life vest for kayakers that was aquired by Stohlquist. He also set the world record for taking the highest waterfall in a kayak, a feat he undertook so that he would be able spread a message of peace through the media. An accomplished outdoorsman and traveler, Ed rode his Xtracycle from Idaho to New Mexico, carrying his kayak and stopping to paddle the most promising rivers along his route. 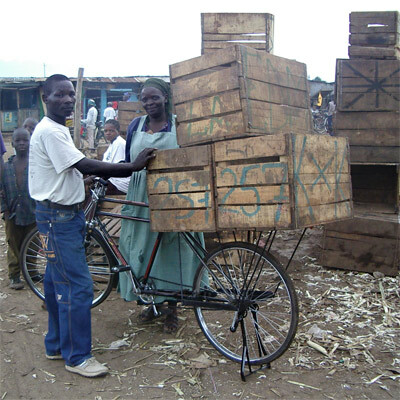 Ed will oversee the production of the fleet of Bigga Boda bicycles from our workshop in Kisumu, Kenya. Ed grew up in New Mexico and attended the University of New Mexico. Gay Evans, Adviser: Gay is the Founder and Director of The Health Education Project for at-risk populations (THE Project) under the El Rio Health Center in Tucson Arizona. Founded in 1990, THE Project takes health and life skills classes to vulnerable persons in Abused Women and Homeless Shelters, Drug and Alcohol Treatment Programs and Women and Juveniles in Correctional Institutions. Founded on the premise that prevention is the best way to end homelessness, it was her hope that taking classes to vulnerable persons, where they are, would reach them as never before. Armed with information taught by caring volunteer teachers, these women might be able to make decisions that would benefit themselves and their children (and society) now and in the future. In 2002 Gay led 60 volunteers teaching classes to nearly 5000 persons. Gay graduated as a registered nurse from Oklahoma Baptist University and earned a Master's Degree in Public Health, Social Sciences and Education from the University of Minnesota. She received her Family Nurse Practitioner Certification from the University of Arizona and worked as a Nurse Practitioner at El Rio Health Center in Tucson for 27 years. XAccess has great opportunities for you to get involved with our efforts. Please check out our "Join in" section for more information. Even if you don't see something that fits you, call us anyway. We love to get creative and put your ideas to good use.